The absolute first thing you should consider when taking off on a motorcycle is how to protect your head. No matter what the helmet laws state in your region (or the region you’ll be traveling to), it is always in your best interest to wear a helmet. I’m not even going to bother listing the numbers that show how many lives helmets save, I’ll just tell you that wearing a helmet has saved my own on a few occasions. The question isn’t whether you’ll fall off your bike, but when. The above quote was handed to me by the man that taught me how to ride motorcycles. It has proven true for me and everyone I know that ever rode a motorcycle. Since a good helmet is the single best motorcycle-related investment you can make, you should always go for the best possible one within your budget. There are many, many types of helmets being sold these days and manufacturers are always innovating in this field, making them lighter and more resistant. You can choose from half-helmets, three-quarter helmets, and full-face helmets. We won’t be reviewing too many half-helmets on this site since they offer minimal protection, not just from accidents but also from dirt, rain, and any other elements you may be exposed to. 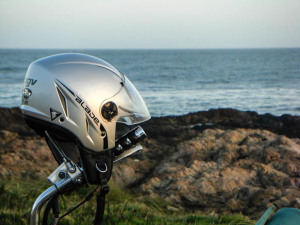 If you’re serious about motorcycle travel then I would steer clear from half-helmets. When choosing a helmet you need to make sure that it fits your head snugly but not too tight. You’re going to be wearing that thing for hours so you want to ensure that it is comfortable. The first test you should do is the “Roll Test”. What this test let’s you know is whether the helmet will stay on your head in an accident (a pretty important feature). To do this, put the helmet on and strap it in. Make sure the strap is fastened snugly but not tight enough that it’ll leave marks under your chin. Tilt your head forward, reach behind your head and try to roll the helmet off towards the front. Use a fair amount of strength. If it rolls off, that’s not a good helmet for your head. Make sure to get a feel for any pressure points on your head or face. If it has adjustable padding, move it around until you feel even pressure throughout the helmet. Pay extra close attention to your forehead and the top of your skull since these will be the areas that will most likely bear most of the helmet’s weight. Other features to take into account are whether it has an incorporated darkened visor, how good the air circulation is, if the visor has an anti-fog coating, and even Bluetooth connectivity so you can hook up to your communications devices and talk to your riding partners. I’ll be reviewing different helmet choices and sorting the wheat from the chaff. In these reviews safety and comfort will always com first. If you’ve had any experience with the helmets reviewed on this site, please let us know in the comments and if you want me to review any specific models, just send me a message through the About Me page. Being an avid “passenger” on the motorcycle, I hear what you are saying about helmets….wear them!!! And that it is a very wise man who taught you how to ride. I had to replace mine once and just glad to be alive so I could replace it!!! Website is looking good and very easy to read. Thank you, Rhonda. Ride safely!